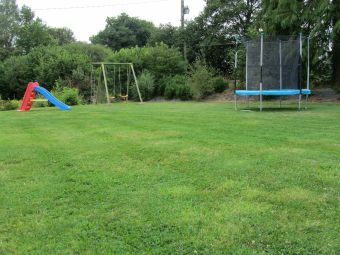 Self-catering holiday gîte in Brittany (France) with large and lovely garden. The Gîte Sant Venter is located in the heart of Brittany and near the Lac de Guerlédan (Lake of Guerlédan), one of the prettiest parts of Brittany. one of the prettiest parts of Brittany. fields, streamlets, lakes and forests. The isolated gîte can be reached by a small country road. 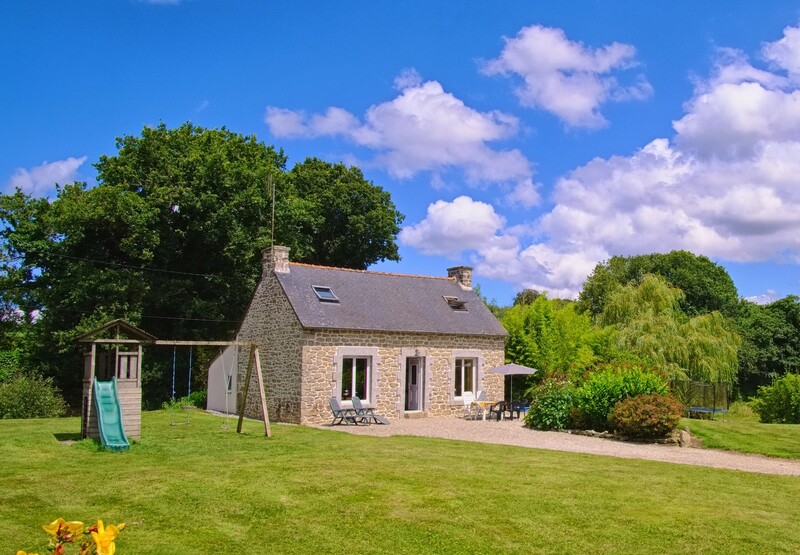 With no neighbouring gîtes, this holiday offers you total privacy and tranquillity. Although the holiday gîte is isolated and located in a rural area, you are within 5 minutes by car of the local shops (bakery, supermarket, bar, restaurant and post office) and weekly market. 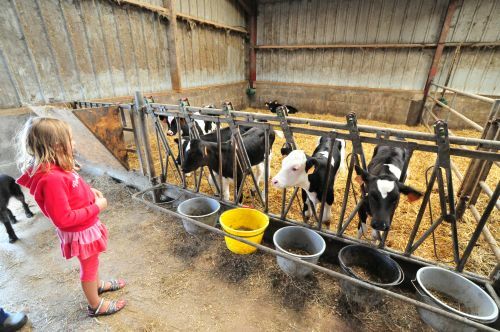 Gîte Sant Venter is a traditional comfortable child friendly holiday cottage. 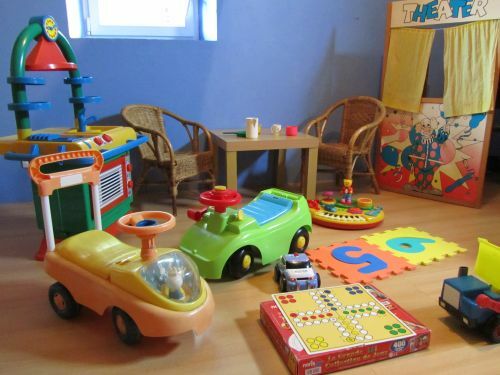 There are a lot of toys, play area, baby equipment. The gîte has been recently renovated to a high standard with all modern conveniences. So you can enjoy a perfect holiday in Brittany. 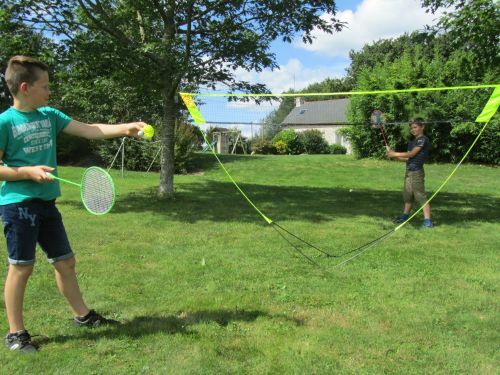 area/ field for to play badminton, foot, frisbee,..
Because of the central location of this holiday cottage, Gîte Sant Venter is an ideal place for exploring Brittany. Within an hour by car you are at the north or the south coasts of Brittany. The north coast of Brittany is well known as "la côte de granite rose" (the rose freestone coast) with its picturesque fishing-villages. It can be therefore concluded, that this detached and pleasant holiday cottage with large garden and play area is an excellent place to enjoy total calmness and privacy throughout your holiday. But also, with a central location, it is in the perfect place for exploring the beauty and wildness of Brittany. The owner of the cottage, Gite Sant Venter, live 600 meters of the cottage. 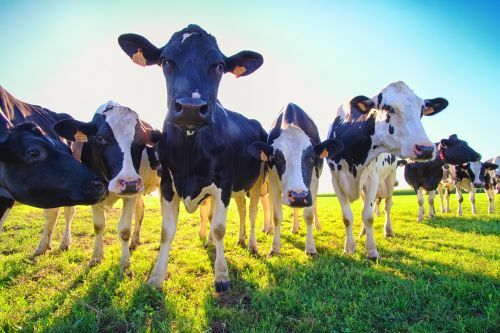 They have a farm with milking cows, calves,etc. If you have some questions, also during your holiday, please contact them. English spoken. “A fantastic holiday cottage with the best peaceful location we have stayed in. Lovely big bath in lovely bath area. Great area for children to play in and explore. Well worth visiting.” Fam. S.
“We had a wonderful relaxing weekend in a well renovated property, tranquil location, a perfect get away retreat.” Mr. Mrs. W.
“Lovely cottage and gardens. Many thanks to Ronald, Miranda and Arno for a warm welcome and a pleasant holiday in Gite Sant Venter” Fam. S.